“Choppers” is the cry that brings the surgeons and nurses running to attend the badly wounded soldiers from the front. The thumping sound of approaching helicopters signals that soldiers are being airlifted to the 4077th M*A*S*H unit to be treated for their wounds. The H-13H “Sioux”, or Bell 47 in its civilian versions was a direct descendent of the Bell 30, produced right after WWII. Starting in the Korean War, the use of helicopters in the “Medevac” role helped greatly reduce the number of battlefield wounds that would have otherwise been mortal ones in previous wars. The first M*A*S*H unit was established on July 6, 1950, and began accepting airlifted patients after the beginning of the Chinese New Years Eve offensive of 1951. Lieutenants Joseph Bowler and Willie G. Strawn delivered their first four wounded soldiers in their H-13s, after the Battle of Pussan. Able to carry two or three in the enclosed cockpit, the H-13 had provision for two litters to carry wounded patients. The rotors measure 37’ 2” in length, and it stands about 8’ 6” high. The helicopter had a loaded weight of around 2,350 lbs and was, by today’s standards , an underpowered aircraft. The engine was either a Franklin 6VA C32 that produced 176 hp, or a more powerful Lycoming VO-345 that produced 250 HP. The H-13H was a slow moving aircraft with a top speed in its latest version of just over one hundred MPH, and a range of no more than 250 miles. Often the Medevac crews worked at night, delivering the wounded with no instrument lights, and braved direct enemy fire to rescue the wounded. Many veterans of America’s foreign wars owe their lives to these rugged angels of the battlefield. 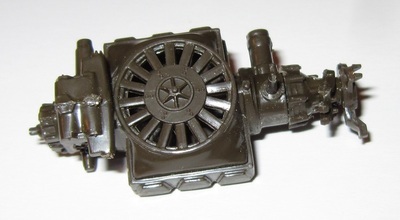 Revell is an old prolific model copany. They have offices in the U.S. and Germany and make all manner of model kit subjects in the popular scales. 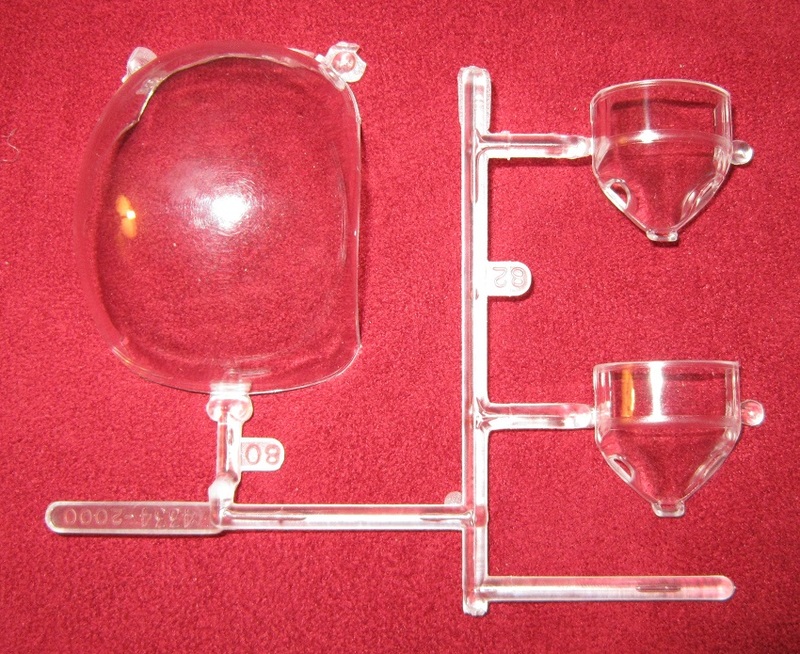 This kit come in a shrink-wrapped tray and lid type box. The box art shows a Bell H-13H “Sioux” helicopter landing on a heli-pad with mountain in the background. Four hospital crew figures are waiting for it to land. It is in overall olive-drab, with the MASH insignia on the cabin door jam. The tail has a guard that is stripped with red and yellow stripes. One side panel gives the kits features in English and French: Authentic replica of a Bell H-13H first production helicopter, a featured 6 cylinder Lycoming engine, single piece bubble canopy and extended tail section, pilot figure with twin controls, molded in olive-drab and clear, decals for 2 versions. This followed by 3 color walk-around photos of the model made up. Next is Revell-Monogram’s address in Germany and their address in Morton Grove, IL USA. The copyright date of 1994 is shown and MADE IN THE USA. The other side panel has a single color photo of the model made up as a side view. 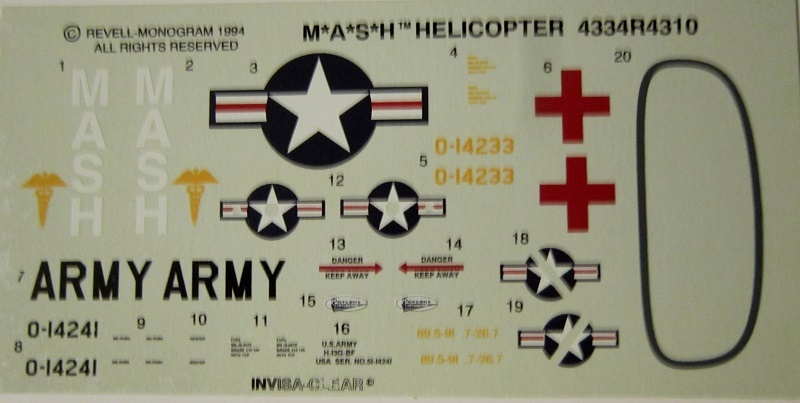 Next is the color box art of another M*A*S*H kit that Revell markets. It is the “Swamp” scene diorama kit with a tent, sign post and jeep shown. No kit number is mentioned though. The skill level of this H-13H kit is a 2. 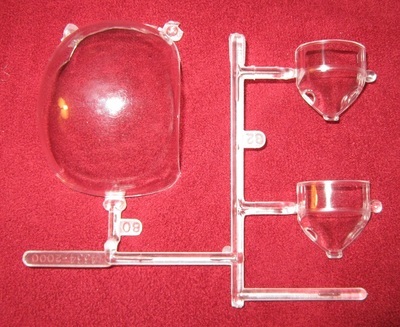 The kit contains 71 parts. Thanks is given to Bell Helicopter for assistance with the kit and the M*A*S*H T.V. show is mentioned. This show ran from September 17, 1972 until February 28, 1982. It came on right after the Hollywood movie by the same name that premiered in 1970. Cement and paint are not included and the kit is designed for modelers over 10 years of age. The kit contains 2 trees of olive-drab parts and the fuselage framework part also in olive drab. 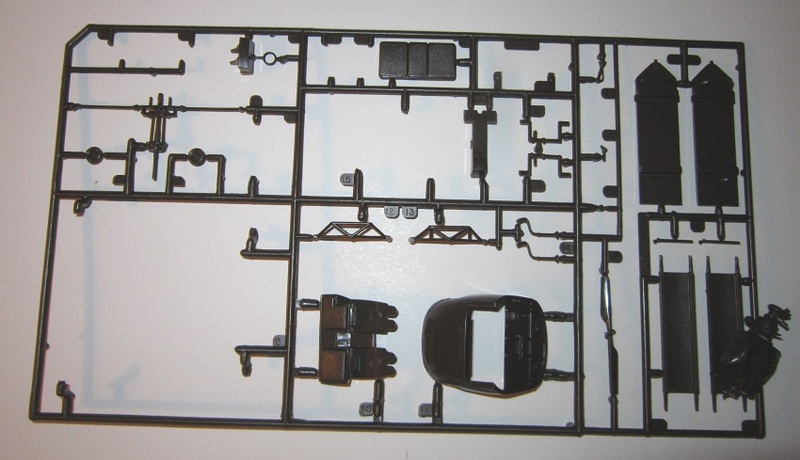 A sprue of clear parts, the decal sheet, the instructions and a card to use to order Revell’s catalog complete the kits contents. The instructions consist of 2 sheets, folded in the center to create a 8 page unbound booklet in 8 ½” x 11” page format. Page 1 of the instructions begins with a slight variation of the box art in black and white, followed by the history of the Bell H-13H in English, Revell’s address in Morton Grove, IL. The 1994 copyright date and MADE IN THE USA again. Page 2 begins with “Read before you begin” instructions in English, Spanish and French, followed by international assembly symbol explanations, a list of paint colors suggested to use to complete the model (no brand name mentioned for these), a 1-800 phone number to call with any kit problems, an address in Des Plaines, IL to contact for customer service and an address to use to order the Federal Standard Color numbers from. Page 3 to 7 give a total of 10 assembly steps. Page 8 has two 2-views (top and bottom) of 2 painting and marking schemes. 1. 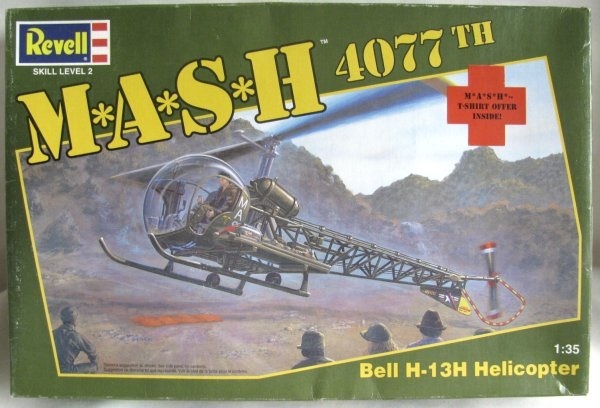 The M*A*S*H helicopter shown as the box art. 2. A H-13H in Arctic/Desert/Jungle scheme. It is red and white. No parts trees illustrations are in the instructions. The parts trees are not alphabetized, but the part number tabs are next to the parts. Study of the assembly drawings will have to be carefully done in order to get the right parts per assembly. There are no casualty figures to go on the two litters in the kit I wish there were. I have started to assemble the treacle-like fuselage frame. Only about 5 parts and the Lycoming motor. I have always loved the T.V. show and it still appears in syndication on some cable channels. Highly recommend this kit. I was re-released as late as 2011. I bought my kit at my local hobby shop 20 years ago at the price shown above.